Derrick Bell was a man of many facets, no doubt reflecting the contradictions in his own life. He was born black in a white supremacist nation. He grew up during the Depression, the son of an Alabama farm worker who had a sixth grade education and migrated to Pittsburgh in the 1920s where he worked as a porter at Kaufman’s Department Store. By Bell’s own account, his mother had a stiff backbone and personified the theme of another of his books, Confronting Authority. He found sustenance and inspiration in the black church, leading him to write Gospel Choirs, a medley of parables and essays that invoke the irrepressible spirit of the gospels. As a young boy with a paper route in a segregated black neighborhood, he encountered educated blacks who had "a worldliness that I envied and longed to emulate" and who urged him to become a lawyer. After two years in the military, he enrolled in the University of Pittsburgh Law School, the only black in a class of 140 students. His first lawyering job was in the U.S. Department of Justice, until he was told by supervisors that he would have to resign from the NAACP because it was deemed a conflict of interest. Instead he resigned from the Justice Department. All of this, of course, was only a prelude to the Derrick Bell we all came to know as a public figure: the young lawyer who worked at the NAACP’s Legal Defense Fund on desegregation cases with four other lawyers, including Thurgood Marshall. Bell went on to become the first black on the faculty of Harvard Law School in 1969, thanks to the demands of student protesters to hire a black. In 1973 he wrote his landmark casebook, Race, Racism, and American Law. This volume, now in its 8th edition, became the bible of the emergent field of Civil Rights Law. Furthermore, Bell helped to inspire and nurture two generations of civil rights lawyers. Through his scholarship and his inspiration, Bell emerged as one of the founders of Critical Race Theory, which transformed knowledge and learning in ways that extended far beyond the world of law. As is well known, in 1990 he resigned from Harvard University Law School to protest the school’s refusal to appoint a female of color to the faculty, and took a visiting position at New York Law School where he taught courses on constitutional law and critical race theory. 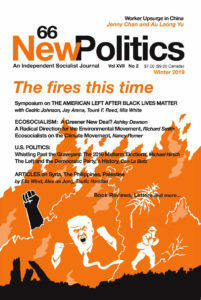 During this period Bell became a Sponsor of New Politics, and we list him on our masthead with pride. In an essay, "A Testament of Hope," published after his death, he [King] wrote of his setbacks, the time spent in jails, his frustrations and sorrows, and the dangerous character of his adversaries. He said those adversaries expected him to harden into a grim and desperate man. But: "They fail, however, to perceive the sense of affirmation generated by the challenge of embracing struggle and surmounting obstacles." So, while Dr. King led a struggle toward a goal — racial equality — that seemed possible, if not quite feasible, in the 1960s, there was a deeper message of commitment to courageous struggle whatever the circumstances or the odds. "Courageous struggle whatever the circumstances or the odds." Indeed, this was Derrick Bell’s testament as well. Stephen Steinberg is Distinguished Professor of Urban Studies at Queens College. He is author of Turning Back: The Retreat from Racial Justice in American Thought and Policy and Race Relations: A Critique.